2-4" long, ovaloid, brown skinned, hairy fruit with juicy, golden-yellow, acidic sweet flesh. Grow in well drained soil. Fruiting occurs on mature growth (at least a year old), and slows on old wood (over 3 years). Plants are male or female, so cross pollination is necessary for fruit set. For backyard culture, it can be common to grow several vines together in a clump in order to ensure both sexes. 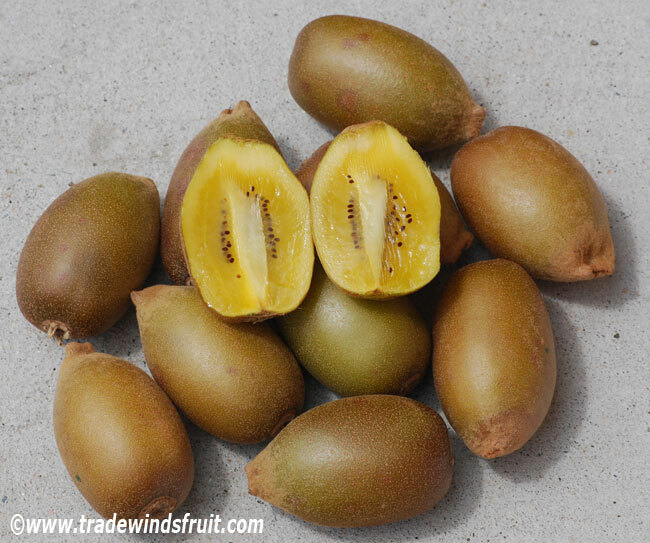 The golden kiwi is very similar to the green kiwi (Actinidia deliciosa) in growth patterns and outward appearance. Usually eaten fresh, but also used in beverages, desserts, and as a flavoring.